‘Fake-news’ and ‘post-truth’ (postfaktisch) are the words dominating today many discussions about truth in communication.
' ... in post-truth [post] has a meaning more like ‘belonging to a time in which the specified concept [truth] has become unimportant or irrelevant’' (https://www.oxforddictionaries.com/press/news/2016/11/15/WOTY-16). The Reporters’ Lab maintains a database of global fact-checking sites. And Alexios Mantzarlis ‘collected 366 links, one for each day of the year … to understand fact-checking in 2016′. Officials Statistics collect, analyze and disseminate statistical information since long and are also confronted with wrong citations, misuse of statistics and lies. Many of the ethical codices of official statistics recommend acting against such false information. 1.7: The National Statistical Institute and Eurostat and, where appropriate, other statistical authorities, comment publicly on statistical issues, including criticisms and misuses of statistics as far as considered suitable. N.B: Wikipedia’s page on Misuse of statistics presents a broad view how readers can be fooled by many types of misuse. False – and especially deliberately false – information as a weapon in manipulating decisions isn’t new either. But new is how such information spreads: with the help of social media dissemination gains a new level (some say like earlier Gutenberg’s printing press ). ‘I was a victim of a Russian smear campaign. I understand the power of fake news. It was a peculiar experience, but I learned a lot. As I watched the story move around the Web, I saw how the worlds of fake websites and fake news exist to reinforce one another and give falsehood credence. Many of the websites quoted not the original, dodgy source, but one another. There were more phony sites than I’d realized, though I also learned that many of their “followers” (maybe even most of them) are bots — bits of computer code that can be programmed to imitate human social media accounts and told to pass on particular stories. May 2017 become the year of people who know about the power and the dangers of misleading information! My best wishes to the colleagues in Official Statistics and their professional producing and disseminating information …. and perhaps statistical dissemination will need to be more active on social media, too. 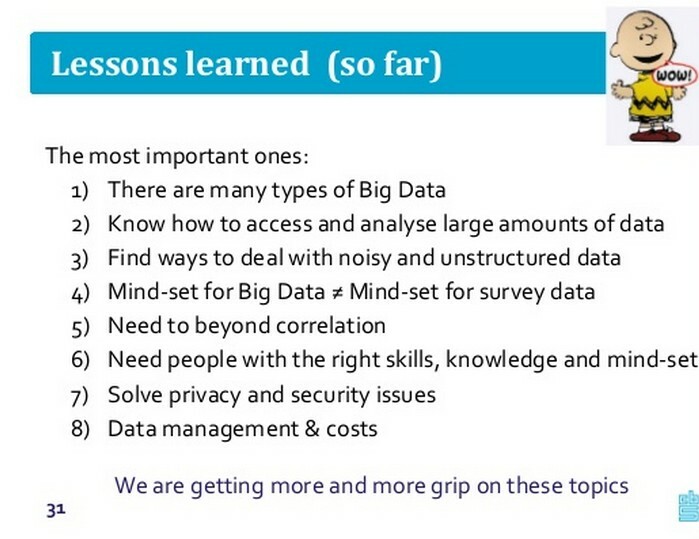 Not long ago in Official Statistics the topic ‘Big Data’ was mostly discussed in a theoretical manner. However, now more and more real, and solid examples appear and demonstrate how Big Data work and what their outcome could be. Some of these examples come from (Official) Statistics. These institutions use Big Data as a source and start applying a new analytical paradigm. 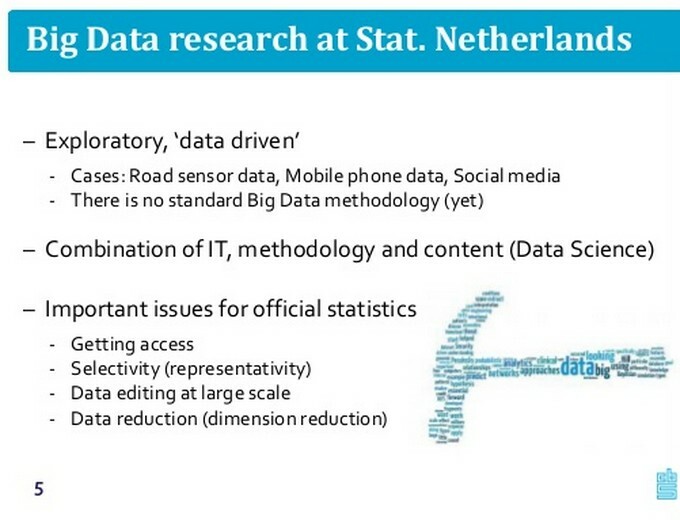 In Statistics Netherlands (CBS) Big Data is an important research topic. social media data for a sentiment analysis tracking words with their associated sentiment in Twitter, Facebook, Google+, Linkedin, etc. A dedicated wiki offers an overview of the ever growing activities in the field of Official Statistics and Big Data. It’s managed by the Geneva Office of UNECE. The wiki provides an interesting Big Data Inventory. Frightfully Boring? Not at all! Statistical information is frightfully boring, it doesn’t regard me as a person! Yes and no. Yes, official statistics is not interested in a single person, data protection forbids this. But no, on a aggregated level we can find a lot of knowledge about our own situation. Interactive applications offer this. 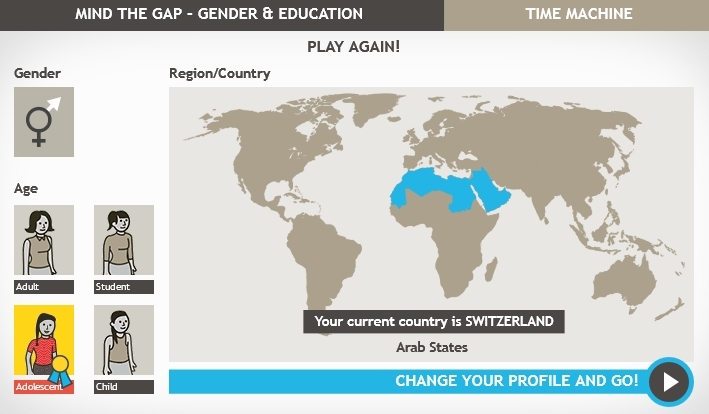 Mind the Gap, a new online tool highlights the situation of girls and women in education. But my favourite from a presentation view is still the Australian Census Spotlight, the new version with a personal infographic and social media link. Why? Perhaps it’s because there’s a speaker helping me navigating the information and leading me to some insights about the group of persons I belong to. Open Data flourishes and more and more open-data sites are launched with sophisticated functionalities. So now http://open.undp.org. Open Data is meant as an invitation to use the data by third parties. ‘The data used on this site is free to use under the Creative Commons’ Attribution License (CC-BY) and available in the following formats. Use the following collection of API endpoints in your application or download the source.